Compact games on a 6 x 6 grid. This is the first of what may become a series of posts, that looks at getting a game onto a small battlefield. DBA probably best defines what we might feel is both small and practical, so starting with a 2' x 2' (600mm x 600mm) board puts us in good company. I favour grids (hexes really), so the posts will reflect the playing area being divided into a 6x6 grid, but hopefully the series will be of interest to all space strapped gamers whether they uses hexes, squares or open tables. This sort of battlefield helps with limited gaming space, restricted budgets, smaller collections and is convenient for gamers who need their gaming area to be totally within easy reach and accessible from a sitting position. Today, we will be looking at some tactical WWII combat. Just as an initial note, though we want the board measurements to be divisible by six, the 'zig-zag' nature of hexes means that the board needs to be half a hex wider, though not as deep, so the set up you see here is in fact 26 inches wide and 22 inches deep. A grid of squares (rather than hexes) would be exactly 2' x 2'. Anyway enough of the gabble, lets get straight on with a game. This post covers a WWII firefight amongst the suburbs of a city on the eastern front. These sort of scenarios always remind me of the opening scenario from Basic Squad Leader game by Avalon Hill - The Guards Counterattack, something I first played in 1977 and which put me on a course of being a life long WWII tactical gaming enthusiast. The mix of blocking defensive terrain and open space should keep the game both interesting and challenging for both sides. The AAR shown here is played using my own hex based rules (free to download - see the Resource Section at the foot of his post), Tigers at Minsk, but the intention is that any rules can be used, so the scenario notes will help conversion to other rules. There is a road that divides the board. On one side (the Soviet side), there are three buildings. On the other side of the road (the German side) there are four buildings. The Soviets begin as the attackers and at the end of play the winner is the player who controls at least five of the buildings on the board, anything else is a draw. The map above shows the road together with associated buildings and parkland. The Soviets begin the game with 3 x Sub Machine Gun squads, 6 Rifle squads and a Maxim HMG. Their morale level is 5. They are Player A, so will go first. They set-up first anywhere on their side of the road. Note - Morale is calculated as the number of bases halved and then it reduces by one for every casualty suffered (base removed). When it reaches zero, all bases of that side must individually test for disengagement and repeat every time a further loss is sustained. Note - Tigers at Minsk allows up to three units to be in a hex, but any hex containing 2 or more infantry bases (not including HMG) suffer a 'Target Rich' penalty when fired upon. Note - In Tigers at Minsk, SMG units only have a range of 1 hex, so here, they are going to have to move out and assault, rather than engaging in firefights from cover. The Germans begin the game with 5 rifle squads and a MG-42 HMG. Their morale level is 3. They set up second anywhere on their side of the road. Once they have set up, the Soviet player may place a smoke marker in one of the six road hexes. Admin - the game begins at 0800 hours and will end at 0910 hours. Note - Tigers at Minsk uses a randomly progressing game clock, for other systems, this scenario roughly translates into 8 to 10 turns of play. Reinforcements - The Germans were notable for being able to organise rapid counter-attacks. Once 0830 hours (say turn 4 in other rule systems) has passed, on the subsequent turn, the German player receives a spotter and a single off-board artillery fire mission of 80mm mortars (see replay to get an idea how this works). The spotter can be placed in any hex that is with or adjacent to a German unit, they always count as being in cover. At the same time, the Germans get two rifle sections as reinforcements. 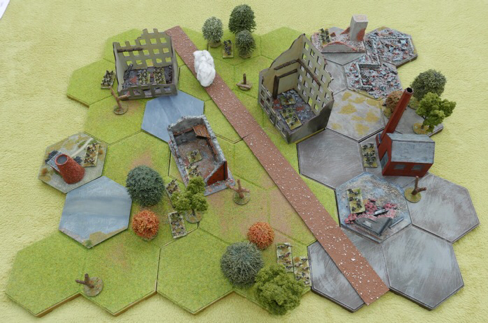 These will enter the board together on either of the two corner hexes on the German half of the board. The moment they arrive, the German morale level will increase by 1 point. Special rule - The first time that double 1's are rolled when a unit fires, the other side will randomly select one of their units (not HMG's) to become Berserk. Normal play is immediately suspended, while the berserk unit conducts a special attack. The Berserk unit will immediately remove any pin marker or opportunity fire marker they may have and is picked up and simply moved into the nearest enemy occupied hex (randomly select if there are equal opportunities). A Close Combat is immediately fought. If necessary, repeated rounds of Close Combat are continually fought until one side is removed from play, though both sides could potentially wipe each other out in the same round of combat. At this point, play again reverts to the normal sequence of play. This is a one off event and cannot occur a second time. The below map shows the initial dispositions chosen by the sides. The circle symbols are rifle and SMG sections and the diamonds are the heavy machine guns. The three SMG sections are highlighted on the top left part of the map, this being the main assault force of the attack. 0800 hours - the opening action. 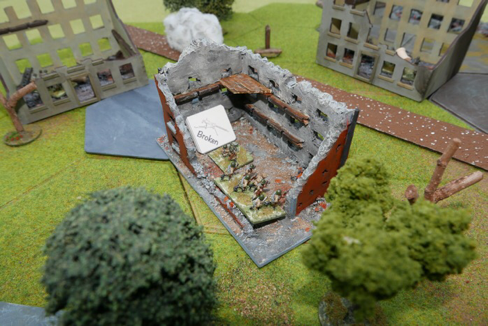 To open the attack, the Soviets put their centre (rifle and HMG) and the SMG teams on their left into command. Everything fortunately pass their command tests, so a good start. For their part, the Germans only manage to get their HMG and the infantry in the woods on the right into command, everything else fails, clearly the Germans have been taken by surprise. Their HMG fires into the smoke, which is still luckily hanging around - but to no effect. 0809 hours. Soviet Morale 5, German Morale 3. On the left, Soviet SMG teams enter and capture the woods (above), the German rifle section is removed from play and their morale drops from 3 to 2. The Soviet attack on the right gets underway, but as the first section enter the road, they are pinned by rifle fire. The smoke does not disperse. 0819 hours. Soviet SMG sections reorganise and lose their pin markers. A general firefight opens along the line, resulting in a number of new pins. 0828 hours. The Soviet Maxim HMG fires from the centre building, they effectively pin the units (including the MG-42) opposite, in the Hotel Vasalov, but their HMG becomes broken (above) and cannot be repaired, the loss of this suppressive fire capability is a real set-back for the attackers. With the Germans pinned, the Soviets decide now is the time to start advancing across the front, effectively giving the defenders too many targets. The SMG spread out and make for the hotel, dashing across open ground. Over on their right, the Soviet rifle team that had been pinned in the roadway takes further casualties and is removed from play ( dropping morale down to 4), while in the hotel both the HMG and rifle team manage to recover from their pinned status - this is a perilous moment for the attack. 0834 hours. Soviet Morale 4, German Morale 2. The German HMG fires on an approaching SMG team and pins it, while itself passing the opportunity fire check, so is not marked as fired. German reinforcements enter play, working their way though some rubble (above), while the spotter takes up position on the left. The spotter does not call in the mortars as the risk of friendly fire is too great. 0856 hours. A random event is activated, which must be dealt with first. 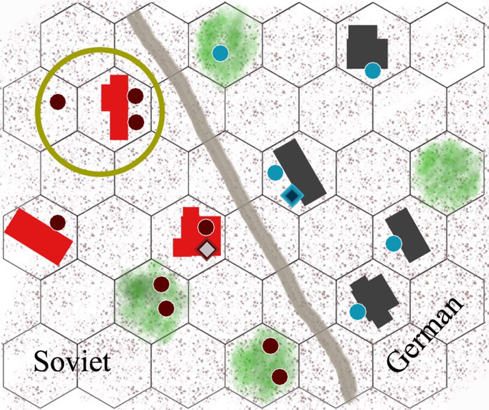 This results in the Soviets getting 'Tank Fright', so those in cover cannot leave cover this turn, this is not so damaging to them as their key troops are out in the open. The Germans get air support, which is very lucky for them. It strikes along the road outside the hotel and removes one good ordered Soviet rifle section from play. Soviet morale drops from 4 to 3 and this loss together with the number of pinned units has probably saved the hotel from close assault. The spotter calls in mortar fire against the building opposite the hotel. They fail their accuracy test and so must roll to see which player takes over the deviated shot. they are luck and they retain control. 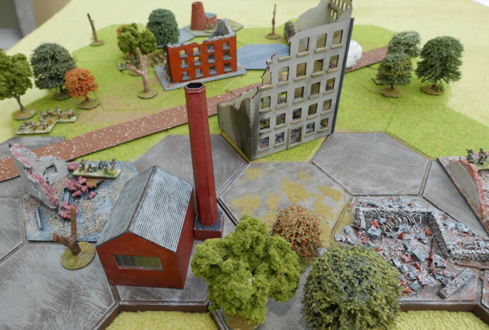 The Soviet player pushes the mortar shells into the parkland next to the targeted building, pinning a rifle section. 0901 hours. With just 9 minutes of this scenario remaining, the Soviets are in poor shape due to casualties and pins. They cannot prosecute their attack further. Instead they set about securing the buildings they already control. 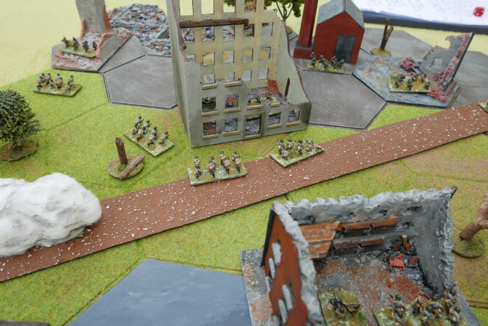 As they pull back, the German MG-42 fires and removes a SMG section and the Soviet morale crashes down to zero. This causes all their units to take break tests, which most fail and those that do, have to drop back one hex, including the rifle section at the mill, which retreats off the board. The German sections are too far away to be able to capture any buildings in the time remaining and so the game is called as a draw - no doubt a second attack will be launched before the day is out! CONCLUSIONS - As an opening game to the 6 x 6 series, I thought it went rather well and while further tweaking may be needed for scenario balance, it was engaging for both sides. The Soviet SMG teams are disadvantaged by weapon range, but if they can close in to get into Close Assaults, they can be most formidable. In TaM, the command system takes away total control from the player, so that just when the rifle section needs to fire or move .... they might not and in a game this size, that does bring a bit of dynamism to play. There were some real pivotal moments in the game. 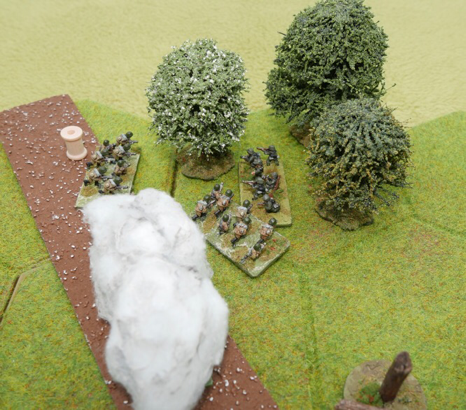 The Soviets lost their HMG just as their units were crossing open ground. The Germans who had been sufficiently pinned, suddenly recovered to put up a feisty defence and were aided by the lucky arrival of that air support, which effectively put an end to the assault. I should have put the SMG units on the right flank as they could have progressed easier through the built up area, as I felt that once they took the woods, they were a bit out on a limb and got cut down as they tried to reach the hotel. The special rule (Bersesrk Unit, needing double 1's) did not kick in for this game, but in my last replay it did, causing a German unit to successfully take a Soviet building and causing them a real problem in recovering from that blow, so it is a useful quirk to keep in the game, as it can throw a spanner in the works for either player, giving some nice narrative. I feel the scenario was successful from the point of view of demonstrating that a lot of tense action can take place in a relatively small gaming space and I would be quite happy playing it a few more times, if only to see, from a balance perspective, whether the Soviet order of battle needs a little more help. 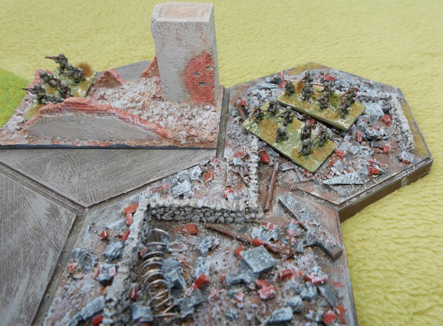 This game was played out on Kallistra Hexon terrain boards with Pendraken 10mm figures. Great post. 6 by 6 is the way to go! Good stuff, Norm. Thanks for posting. An interesting blow by blow game report. When playing on a confined area I always find there is more thinking about limiting the number of units to ensure a challenging game. The temptation of larger playing areas is to overload them with too many units and end up with a slogging match. An excellent BatRep, Norm! Enjoyable recount accompanied by instructive photos. I gained my "serious" WWII gaming chops on the original SL series along with GDW's Europa series although I did not discover SL until early 1980. Played the heck out of SL/COI/COD/GI series for years especially many long games via PBM. Remember those days of exchanging snail mail to conduct a game? With a small collection of 15mm WWII figures, I have longed to find a comparable system to SL in miniature. Having really enjoyed your replay and downloaded your rules, perhaps I have found it? My collection consists of early war British, French, Germans, and Norwegians. Any thoughts for adding details for early war protagonists? THat addition would be much appreciated! Your game in small places really puts the emphasis on doing much with little and husbanding forces. In such a small setup, every unit matters and the wastage seen in larger games is either reduced or eliminated. I find these smaller games really boil down to tactical puzzles for both players. Great stuff and hoping to see more. I plan to read your rules and give them a try. Oh, and I remember "The Guards Counterattack" very well! Thank you all for visiting and Pat, welcome as a new formal supporter, I know you commented on one of my videos recently. Everyone's support is appreciated. Jonathan, I think there is a 'knowing understanding' between all of us that came through the ranks of basic Squad Leader - wonderful times. I am looking at the next period / campaign to push my Tigers at Minsk and of those who have mentioned it, popular requests have been Poland '39, France '40 and France '44, though there has been an emphasis on France '40, so in view of your interest, I will start to look at that as the next thing (need the models though). I am also doing a short (1 page)amendment sheet for using the system with 4" hexes, but with 15mm, so again that may interest. I hope you find some of the aspects of the Tigers at Minsk rules of interest. Norm, stats for 1940 or 1941 would be most welcome. Yes, rules using 4 inch hexes for my 15s would be of interest. Norm, do you have a QRS available that condenses all of the charts into an easy usable format? Jonathan, only the 4 pages at the back of the rule set, pages 25 - 28 inclusive. They have been set out to give the player two back to back QRS. I basically run my game off these plus the two equipment lists. As you know, I am quite fond on battles on small tables so will be following your 6x6 series with great interest. Shaun, 2' x 2' puts me right into the heart of your territory :-) I have some dark ages bowmen on the painting table at the moment, so may at some point be able to stray into your pre-gunpowder interests. Basically there are 2 x 10" boards, put together to make a 20 x 10 board. Both sides get plastic 8mm Napoleonic figures. They call it a travel package and it seems the focus will be playability..... something for us all to like. Keith, I think the Travel Battle has the potential to become a big thing in the hobby. The Perry Twins have an excellent track record and I am sure they this will be good for us all. Thanks, I hope you enjoy a good look around.